Seasons make a big difference for Mars vistas. Tosol Mars is at solar longitude 139, meaning that it is halfway between winter solstice and spring equinox in the southern hemisphere where Curiosity resides. The atmosphere around the globe is the clearest in southern winter. Once spring starts, turbulence increases and dust storms begin. The rover team is taking advantage of the clear skies to take long-distance ChemCam RMI mosaics of the terrain on Mt. Sharp and on the crater rim. We are especially interested in a Mt. Sharp unit characterized by features that look like yardangs, which are typically wind-sculpted elongated features in a landscape that is experiencing erosion. We're also very interested in the apparent fluvial channels seen descending from the crater rim. The accompanying Navcam image shows at least two channels (you may have to zoom in to see them). The one at the far right is named Peace Vallis and has already been the subject of some studies. We are curious - when was the last time that water flowed down these channels? Was it steady flow, or catastrophic? Is there evidence of snow and ice, or was the water more likely delivered as rain? 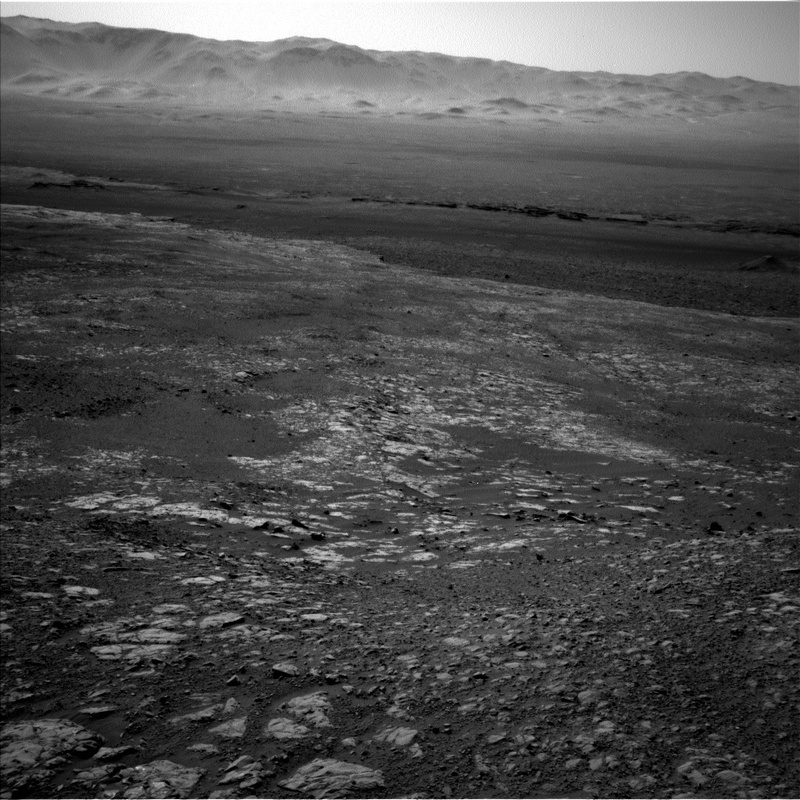 Under clear skies, Curiosity drove ~30 meters yestersol and is now stationed on a gravelly patch of ground. The rover is heading northeast along the top of Vera Rubin Ridge. With only gravel underfoot, the arm instrument teams decided to forgo contact science at this location. ChemCam and Mastcam will observe small bedrock targets "Sgurr nan Gilean" and "Braemar." Mastcam will use optical filters to observe the latter target. After a planned long northerly and slightly downhill drive aiming for 82 meters with visual odometry, imaging of the surroundings will be done by Hazcam, Navcam, and Mastcam. It will include a Mastcam clast survey. AEGIS software will use the Navcam images to pick a target for ChemCam to shoot. On the second sol of this plan ChemCam will take long-distance images of the yardang unit on Mt. Sharp and of the Peace Vallis area as noted above. Navcam will take several movies to look for dust devils and thin clouds. DAN, RAD, MARDI, and REMS will also take data.